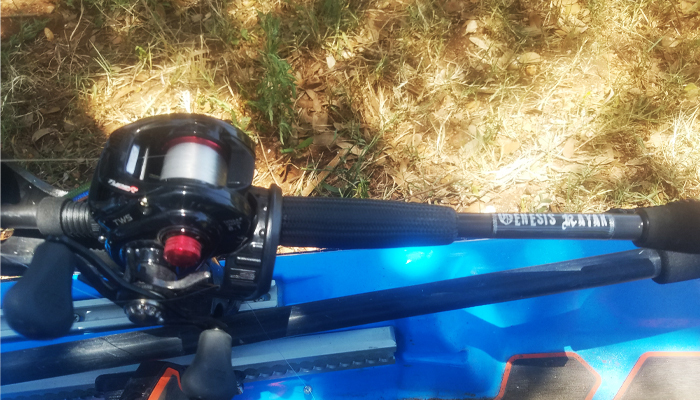 Thanks to the folks at Tightlines Premium Fishing Tackle in Killeen, TX I was able to get a test run with the new Leviathan Genesis Kayak rod. Made with premium components, a Loomis blank, and a carbon fiber grip, the Genesis held great promise in the store but needed a day on the water to really report out on it. Luckily that happened this weekend and you can find my notes below. The Genesis Kayak rod retails for $199. Before I give you the Good and Points of Improvement, here’s a little about Leviathan Rods. Leviathan Rods is a Dripping Springs, TX company that was founded to create fishing rods that look better, feel better, and fish better than any other rod on the market. You can’t buy a better fishing rod. Every component is chosen to create fishing rods that are unsurpassed in both form and function. All Leviathan Rods products are designed and handcrafted in the United States. Leviathan Rods is driven to equip anglers to fully engage with the wonder and power of God’s creation every time they go out on the water by providing them with the highest quality, top performing, most responsive fishing rod we can make. I paired the Leviathan Genesis with a Daiwa Tatula Type R reel lined with 14lb fluoro. The Genesis rod I tested was a 7′ Medium Heavy rod with a Fast tip. I threw a 1.5 squarebill, a 1/2 ounce chatterbait, an 1/8th ounce drop shot setup and a topwater prop bait. The Leviathan Genesis was able to throw all of the baits I tried with no issues. 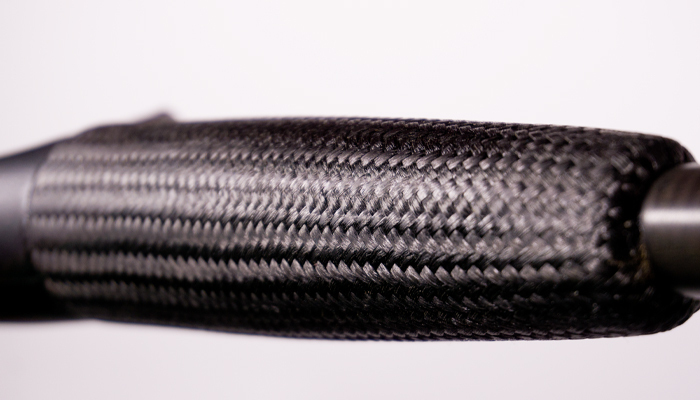 The carbon fiber grip isn’t clear coated so the fiber gives the angler a good grip even when their hands are wet. The shorter handle works well for wrist twitch applications like drop shotting. When you look down the spine of the rod to check guide alignment the Genesis is probably one of the straightest guide eye alignments I’ve ever seen on a custom rod. The precision is definitely there. 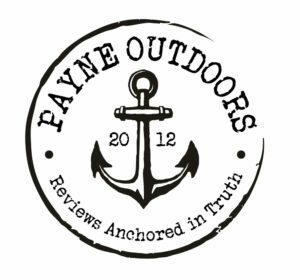 The snake style guide on the Leviathan Genesis Kayak rod. I was afraid when I was testing the rod tip flex that it might be powered closer to a medium than a medium heavy but that’s why I like to field test. I got to tangle with a pretty good fish in the 22-inch range while using the rod and I felt the backbone of the rod kick in. It is stout for sure. The sensitivity is a little misleading in relation to the power. It’s not often you can get good sensitivity and a brutish backbone for under or at $200. The line guides are interesting on the Genesis. The largest guide looks like a Pac Bay Snake Guide which doesn’t have a center line for the heel and toe of the guide but rather an offset pair. The first and last guides have inserts but all those in between do not. The internal line guides are polished with no inserts at all. The line transition through the guides is very smooth and doesn’t impede line deployment. The carbon fiber grip is nice, don’t get me wrong, but for normal sized hands, it’s a little bulky. For folks with “banana fingers” as my buddy Jon says, the size of the grip will be awesome. I’d like to see it about 3/8 of an inch smaller in circumference. The apparent trend in the market is for kayak specific rods to have shorter handle lengths. The Genesis is no different but I wish it were. I prefer a longer handle length so I can tuck the rod under my arm to fight a fish. This really becomes important when you are trying net a fish with one hand and horse them with the other. Anglers have more power in their shoulders and core than in their wrists so being able to wedge a handle against your ribcage or under an arm during a fight is nice. 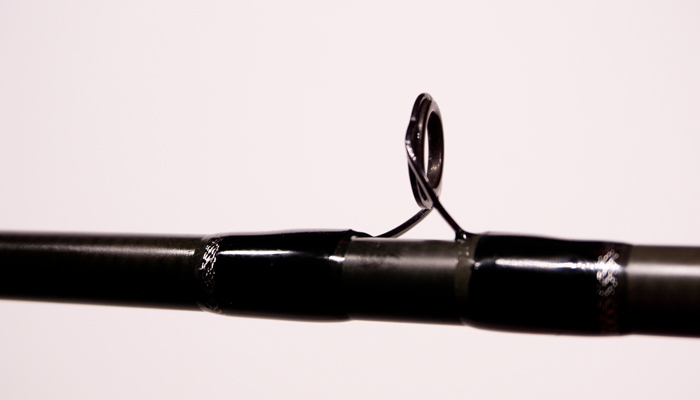 You don’t need this as much in a drop shot setup because the wrist plays a vital role in the twitch but to me, a medium heavy rod should have a longer handle. The Leviathan Genesis Kayak rod impressed me. Are there a few tweaks I’d like to see? For sure. That being said I think a lot of people would really be able to appreciate the build out of the rod. The sensitive but powerful blank and the precision with which is it is made really stand out. 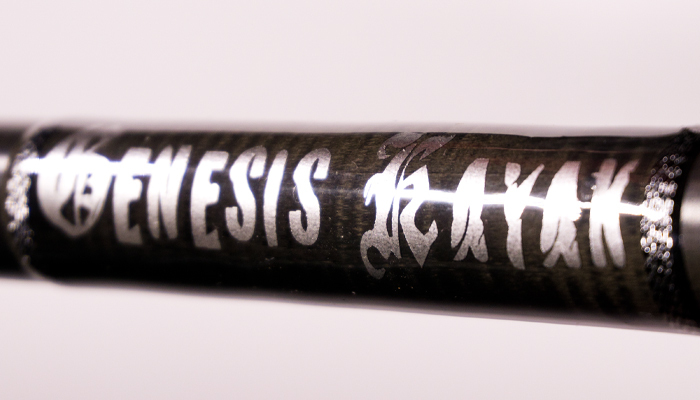 The Genesis Kayak rod is a custom rod at a non-custom price that will earn its way into a lot of arsenals over the next year.